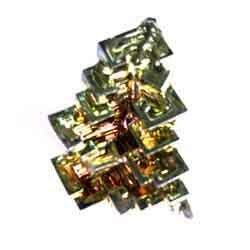 Bismuth in its elemental form is a rare occurance in nature, even more so for bismuth crystals. Lab grown crystals are popular because of their intricate shapes and dazzaling colors. These lab grown hopper crystals form incredible geometric patterns in a stair step arrangement similar to a stadium. The unusual crystal patterns are due the the crystal edges growing at different rates than the crystal faces. They often have several iridescent metallic colors caused by light scattering at a very thin layer of bismuth oxide. Reds, yellows, blues, greens, and purples are common. This is a man made crystal grown in a lab at about 271 degrees centigrade or 520 degrees Fahrenheit. It can only be grown from electronic grade highly refined bismuth. Location: Australia, Bolivia, Germany, England. In the U.S. Colorado, California, and South Dakota.